Brad Keselowski #2 Detroit Genuine Parts Ford Fusion-Same scheme as last year, same C- grade. Austin Dillon #3 New Era Cap Chevy SS-Were it not for the large New Era logo on the side, I would grade this an A. It has every ingredient, but that big logo next to the door number takes it from an A to a B+. Kevin Harvick #4 Busch Bucks Chevy SS-I like the scheme overall, the cash motif looks good, but I don’t like the white door numbers on the side. They blend in too much with the background. The yellow number on the roof works much better. That detail takes the A down to a B+. Kevin Harvick #4 Mobil 1 Annual Protection Chevy SS-Same scheme as #41, same A grade. Clint Bowyer #14 Haas Demo Days Chevy SS-Same scheme Haas, same A grade. Kurt Busch #41 Haas Demo Day/Menard’s Chevy SS-Same scheme as Haas/Monster, same A grade. Jimmie Johnson #48 Lowes/AO Smith Chevy SS-Same scheme as Lowes, same F grade. Erik Jones #77 SportClips Toyota Camry-Apparently, SportClips is sponsoring two different cars, and as a direct result decided that they need two different schemes. Rather than use the same scheme that the #11, or design a brand new scheme, they decided to rehash the 2016 #11 scheme, albeit with some slight changes. I’m not impressed, and I’m giving it the same C- that the 2016 scheme got. 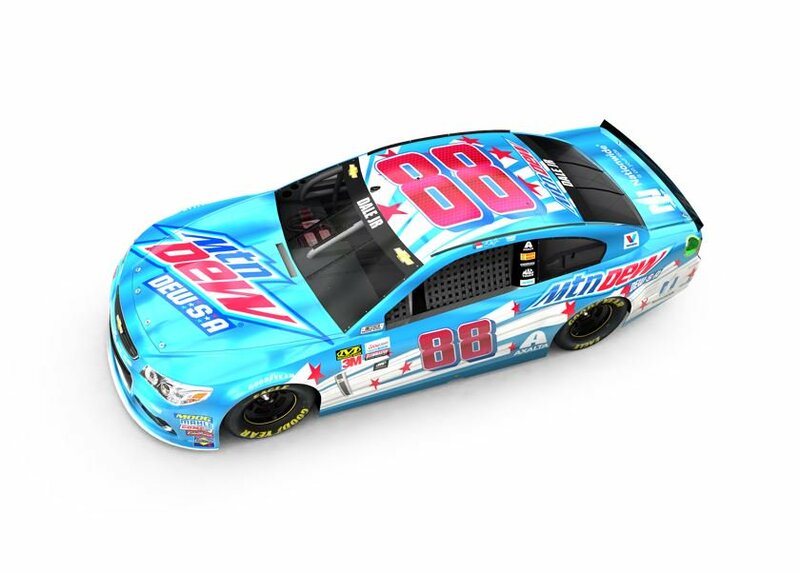 Dale Earnhardt Jr. #88 Mountain Dew-S-A Chevy SS-Why can’t Mountain Dew get a patriotic scheme right? Are they so desparate to make themselves look cool that they don’t get how the flag of the United States looks. The design scheme is bad, but the color scheme is worse. I like the red and white used, but the blue is too light. The design is over done. I’ll give it a C-, since it isn’t as bad as last year…but that isn’t saying much.